It's a new day for The Walking Dead. Like it or not, Rick Grimes is really gone. Gone, but not forgotten; in this first episode of what might be considered a show transformed, his absence looms heavy over both the narrative and the characters inside it. It’s clear that Rick’s time has reached its end; but first, 'The Walking Dead' wants to celebrate his life. Six years have passed between "What Comes After" and "Who Are You Now? 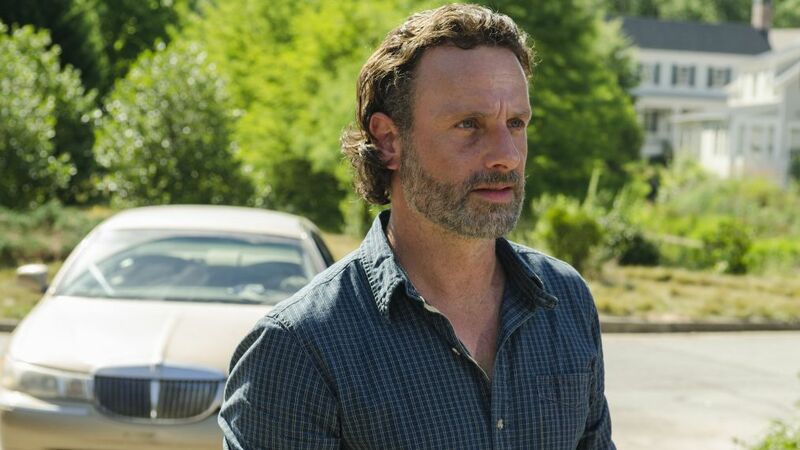 ", but it's very clear Rick's ideologies and influence are still being felt — especially when Judith tries to bring a new group into Alexandria, something their current security protocols prohibit. Some things have changed, some things have remained the same, one thing is certain: The Whisperers are coming, and sooner rather than later. The episode opens with Michonne “talking” to Rick, or at least his ghost, about how she’s trying to look ahead to the future, but the path has only grown darker. As she talks, a montage plays of her finding Rick’s doppelgänger action figure, Daryl going fishing with a spear, Carol waking up with Ezekiel and looking out at The Kingdom. She says that there are still flashes of light, even though they’re surrounded by darkness, and it’s enough to keep going; Daryl sees a bluebird land on a walker’s shoulder, Carol finds a flower. “So that’s what I do,” Michonne says, “every day. For you.” Then she turns around and walks away from the bridge where he made his last stand. The primary storyline during this episode revolves around the survivors Judith wanted to bring into the group; Magna, Yumiko, Luke, Kelly and Connie. Judith is insistent that they be brought into the Alexandria community, but Michonne has reservations, and apparently grew quite a bit stricter since Rick’s death (she’s Alexandria’s head of security). Since Yumiko’s injured, they violate security protocol to bring the group back to Alexandria and treat her. Eventually, though Michonne isn’t too pleased, the Alexandria crew opts to hold a council meeting to vote on whether or not they can stay. The council asks what the four healthy group members did before the apocalypse, what they’ve done to survive and who they are now. Michonne is on the council, but she let Father Gabriel and Aaron do all the talking until they’re almost ready to vote; then, she decides to speak up and ask Magna to take off the glove she wears on her left hand. Michonne announces that the woman has a prison tattoo on her hand. “I can explain,” Magna says, but Michonne orders her to put the knife on the table. As it turns out, Magna’s belt buckle conceals a knife, which when combined with her criminal history, doesn’t look too great. Angered, Michonne walks out and tells the council to take their vote. Whatever they decide, she’ll second. Later, Father Gabriel is tinkering with what looks to be an elaborate radio. Rosita comes to see him, and they talk about how the radio could help find people who need help. Gabe wants to go “further out” on the map and set up a remote amplifier to boost the radio signal, improving their chances of finding people. She’s skeptical, but he’s idealistic, and eventually she caves in and says she and Eugene will take care of it. This conversation ends with a kiss(!). Geez, Father Gabriel’s gotten a ton of action this season! Judith goes to talk to Negan, who seems quite a bit better-adjusted since the last time we saw him. She says she needs his help with a math problem about airplanes, but Negan leads her to conclude she’ll never see one, and he’ll only help her with problems that are real. Magna and her group are a real problem that Negan hadn’t heard about, and surprisingly, he sides with Michonne once Judith explains it. Magna and her group go see Yumiko in the infirmary and later argue about whether or not they should try to stay in Alexandria. Magna wants to “fight” for them to stay — quite literally, as she’s stolen Yumiko’s necklace that turns into a knife — but the rest of her group wants her to leave Michonne alone. They think staying is a lost cause, and once Magna hands over the necklace, Luke tells her to sleep on it. She doesn’t. Instead, Magna goes to Michonne’s house and seems poised to strike with Yumiko’s necklace, which she somehow retrieved from Luke. She sees Michonne playing with a toddler — a Richonne baby?!? — and seems to think better of her actions. She then goes to the front door and hands over her weapon, and she and Michonne talk about having to do terrible things to survive. Magna leaves, and Michonne goes back inside. She and Judith talk about how rescuing those people was what Rick would have wanted, and Judith tells Michonne she knows her “mom” talks to Carl and Rick sometimes. Sorrowful, Judith says she’s not always able to hear their voices anymore, but she hopes Michonne can. The toddler comes running back and calls Michonne “mama,” and the scene ends with a shot of the “Rick Grimes” action figure. Looks like there was a Richonne baby, after all. Alexandria nearly sends Magna’s group packing the next day, but Michonne swoops in at the last minute and says that while they can’t stay in Alexandria, The Hilltop could offer them sanctuary. She, Siddiq and all of Magna’s group head out to see their leader, who is a “she,” according to Michonne, but can’t be Maggie because Lauren Cohan’s last scene was last week. Who’s running things over there? The B-story this episode deals with Carol and her new life at The Kingdom. She and Ezekiel have fully adopted Henry, who is now a teenager and refers to them as “mom” and “dad.” Apparently things have gotten a little run-down in Ezekiel’s domain, and Henry’s none too pleased; he and Carol manage to fix a leaking pipe, but Henry says they need better tools. He wants to train to be a blacksmith at The Hilltop, but Ezekiel tells Carol he needs Henry at home. Carol and Henry leave The Kingdom and bring supplies and food with them. The mission goes well until Henry hears someone shouting for help and jumps out of the wagon. He doesn’t listen to Carol and ends up trapped by a bunch of former Saviors, who eventually force him and Carol to give up their supplies and Carol’s wedding ring. Jedd — yes, that Jedd from earlier in the season — lets them leave, even after Henry tries to kill him. That night, Henry lashes out at Carol and asks why she just let them take everything. She tells him someday he’ll understand, but his words get to her, and she goes back to the Saviors’ camp that night and burns them all alive (and gets her ring back). Later, she and Henry go off-map and find a familiar face: Daryl. “Need a ride, stranger?” Carol asks, and they both smile. Rosita and Eugene head out to install the relay box on a water tower, and Eugene hints that he’s a little (a lot) jealous of Father Gabriel. They find a herd of walker tracks in mud, but they’re going the opposite direction, so they don’t pay them too much attention. As it turns out, they should’ve; after they get the job done, they realize the herd has somehow made a U-Turn (hint: it’s the Whisperers). For a show about zombies, fans of 'TWD' tend to care deeply about the show's romantic relationships. DAMN, CAROL. It’s been a minute since we’ve seen her so vengeful, so full of rage, so cold. Shades of “Stepford Carol” came back this episode — I could almost see her holding that knife to Pete’s throat again. I’m not sure I love how the narrative was making Michonne out to be a “villain” this episode. Sure, she’s tougher than she was, but that makes sense after everything she’s been through and that’s why she’s made it this far. Her caution regarding Magna’s group was well-warranted. Father Gabriel hooked up with Anne, and is — presumably — now with Rosita. Should he write a book titled, “How to Get the Girl at The End of the World”? Clearly, Eugene could use his advice. As much as I loved seeing Scary Carol this week… I am not in love with that wig. I’m not opposed to her changing her hair, but that thing is frizzy and distracting. Michonne’s new look is subtle, but natural; this is jarring. Who’s running Hilltop? It’s not Jesus, because Jesus isn’t a “she.” Either Michonne has no clue Maggie’s gone, or Enid’s running Hilltop. Neither of those things make much sense.